In August 2014, the ACCC commenced its Scam Disruption Project which aims to stop potential scam victims from sending more money to scammers. The project involves utilising financial intelligence to identify Australians sending funds to West African nations and advising them they may have been targeted by a scam. 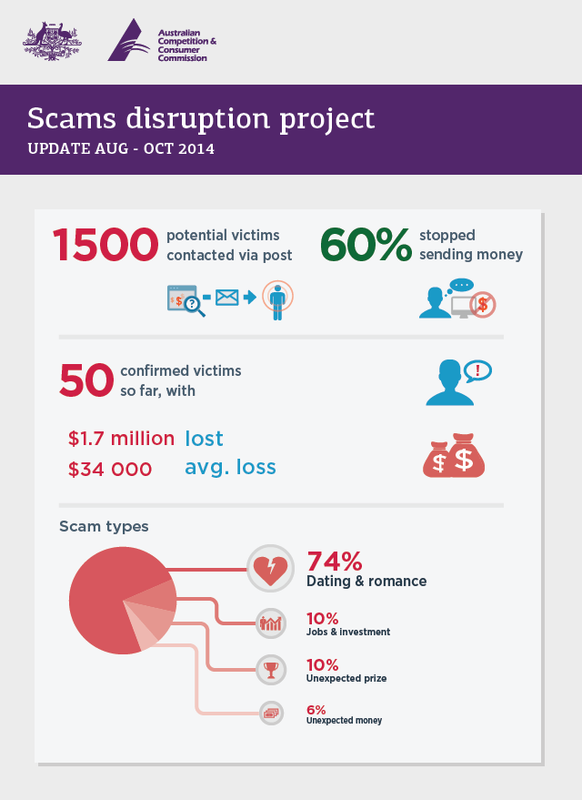 The project commenced because losses reported for relationship scams continues to be a significant concern with total losses for dating and romance scams this year just over $23 million. In the three months to the end of October 2014, almost 1500 letters have been sent to potential scam victims in New South Wales and the Australian Capital Territory. “It is still early days and difficult to draw firm conclusions from the data collected but approximately 60% of those receiving the ACCC's warning letters stopped sending money overseas for at least a 6 week period,” ACCC Deputy Chair Delia Rickard said. “So far we see dating and romance scams being the chief culprit with 75% of victims reporting they had started an online relationship which led them to send money overseas. The scams are equally targeting men and women,” Ms Rickard said. Most dating and romance scams start with the victim meeting someone online. The scammers say they come from a western country and claim to be posted overseas overseeing an infrastructure project, working for an oil company or deployed as a soldier or peacekeeping force. The scammer quickly declares his or her love for the victim and the requests for money soon follow. Excuses for why the victim needs to send money are elaborate and varied but there is always some barrier or event that stops the scammer being able to come to Australia to be with the victim. Victims believe they are helping pay for airline tickets, military leave passes, visa applications, medical expenses or government fees. The requests are endless, promises are never kept and there is always another excuse for why more money is needed. “What we often hear from victims is that the scammers introduce a story that they have a lot of money that they got from an inheritance, gemstone dealings, gold bullion or other unexplained wealth but there is always an excuse why they cannot get access to these funds. They promise to share the money with the victim once they get it out of the bank, through customs or pay associated government fees. A common ruse is to say this is a fee for anti-money laundering and terrorist financing regulations. These excuses and stories are designed to extract the maximum funds and commit the victim both financially and emotionally. Unfortunately, the scam can drag on for years,” Ms Rickard said. The ACCC’s Scam Disruption Project is a joint initiative with the Australasian Consumer Fraud Taskforce (ACFT), including state and territory police and consumer affairs agencies to alert at-risk individuals to the possibility of being a victim of fraud. More information can be found at Scam disruption project.